I`m not the author. However there seems to be no way to delete my name from the Tutorial information.I`d just like to share. This is a work of George Astvacaturov. 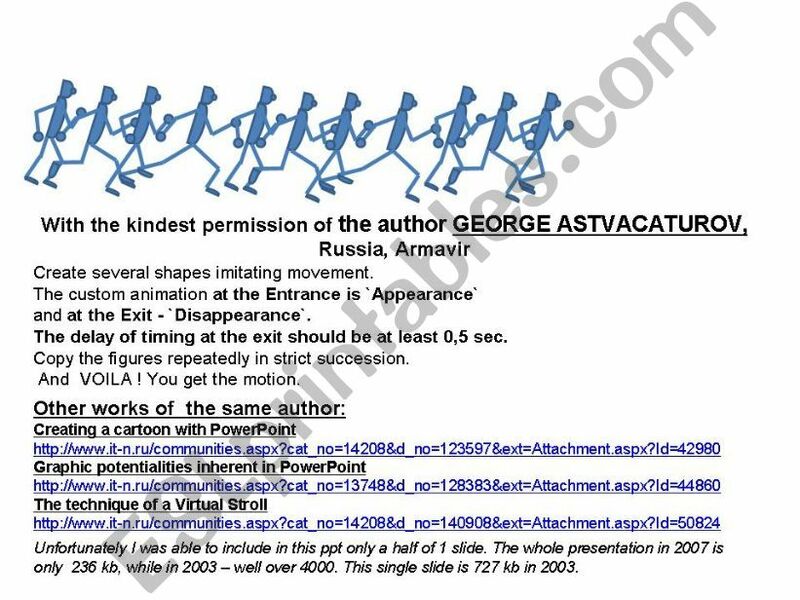 This remarkable ppt was made by a Russian resource specialist and facilitator. I`ve made sure to secure his consent for this. Unfortunately it`s been possible to include only half of 1 slide. The whole presentation in 2007 is only 236 kb, while in 2003 – well over 4000. This single slide is 727 kb in 2003. Hope you like it as much as I do. Thanks a lot for your wonderful contribution! Thanks a lot. Hope I am smart enough to understand. I am poor computer skill. Thanks a lot! quite useful!